Qhapaq Nan is the Andean road system created by the Inca civilization. They used it for the purposes of communication, trade and defence. It reached its maximum expansion in the 15th century. The central square of Cusco, known as Hanan Hauk'aypata, is the origin of the four main roads that allowed the Incas to easily travel by foot to every corner of their territory. This is a serial nomination of over 720km of stretches of road and 291 archaeological sites, stretching across Argentina, Bolivia, Chile, Colombia, Ecuador and Peru. With this huge Qhapaq Nan serial nomination, the Andean countries seem to have clustered all Inca-sites of any importance. I visited the area in 2011, and besides Cuzco/Tiwanaku/Quebrada de Humahuaca which are already WHS in their own right I visited some of the "lesser" sites too. Pachacamac is an easy half-day trip out of Lima. I took one of the dozens of minibuses that leave all the time from Avenida Grau. It dropped me off right at the site's entrance. There's a little museum on site, displaying some pretty Wari ceramics and also textile that has survived the ages due to the extremely dry climate here. Its location indeed is one of the most remarkable things about Pachacamac - it's out there in the desert, within sight from the sea. The site is totally covered in sand. Archeologists are only slowly making their way to the many temples and other features below. Most of it is off limits to visitors, though the Temple of the Sun can be climbed and other parts like the North-South Street have explanatory boards. You can do a full circuit walk of the large terrain in about an hour (if you have a car, you can also drive). Pachacamac was a ceremonial and pilgrimage site between 200 and 1535. It was used by different civilizations: the Lima, the Wari, the Ichma and the Inca. Its most distinguishing fact is that it predominantly is a Wari site, a culture which is not represented on the List yet. But it's not the best place to see Wari remains - Pachacamac never was a central site for them, and the Inca added and altered a lot. Ollantaytambo, the village with the difficult name (they shorten it to Ojanta in everyday speech), is located in the Sacred Valley, between Cuzco and Machu Picchu. Unlike Machu Picchu, the Spaniards have been here. In a famous battle, the Incas led by Manco Inca defeated the invaders. Against a hillside on the outskirts of the village lie the ruins of a religious complex, built by the Incas in the 15th century. I slowly walked up the stairs along the terraces, which are very steep and tightly constructed. What immediately stands out here are the giant blocks of stone, the monoliths. This is something you do not see Machu Picchu. I always associated them with Tiwanaku, Bolivia. On top there are a lot of loose, semi-finished stones on the top. And the ruins of a temple. The complex seems to have been abandoned before it was completely finished. Or hit by an earthquake. This is a fascinating place, with beautiful views over the valley. On a mountain slope on the other side you can still see the remains of warehouses that the Incas used to store their agricultural products. 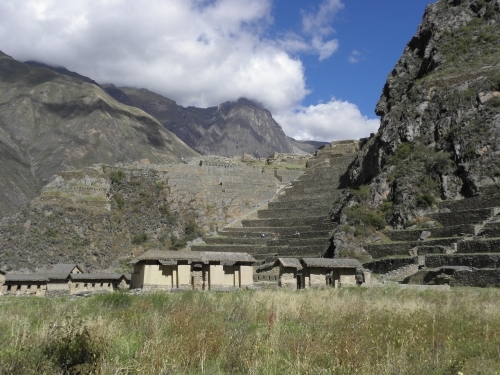 My visit to Ollantaytambo rivalled that of Machu Pichu. In Ecuador in 2017 I visited another one of the associated sites, Ingapirca. The Inca started to expand their empire northwards into Ecuador from Peru only from 1463. They met with a lot of resistance, notably from the Cañari people who were local to the area around Cuenca. The interesting feature of Ingapirca is that it is a mixed Cañari – Inca site. The Inca Túpac Yupanqui ended up marrying a Cañari princess, and the two groups reputedly lived together peacefully afterwards although they kept their own customs. The guides that accompany visitors to the archaeological site identify themselves as indigenous Cañari, and they are happy to point out especially these remains. The Cañari worshipped the moon, and the remains of their Temple of the Moon cover the first plateau at the site. There’s an interesting communal tomb in front of it, with a vertical monolith on top. Here a woman of high social class was buried together with 10 other men and women who – according to the guide – were sacrificed alive. A bit further into the complex a rock with holes in it represents a Cañari “lunar calender”. The different holes were filled with water to catch the reflections of the moon for each moon-month of the year. 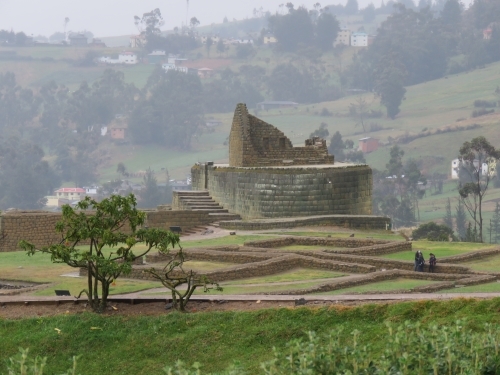 Ingapirca is also the largest known Inca ruin site in Ecuador. The most significant remain of that period is the Temple of the Sun, an elliptically shaped building constructed around a large rock. The typical Inca construction style, that can be seen in the many sites around Peru, is also clearly distinguishable here at Ingapirca. Because of the type of local stones that they used, the temple has an attractive greenish hue. There’s a stretch of Inca road next to the Temples of the Moon and the Sun that was identified by our guide as ‘Qhapaq Nan’ and part of the UNESCO World Heritage. It is maybe 50 meters long and does not seem to go anywhere in particular. 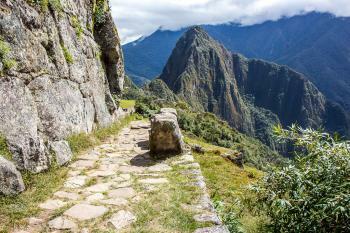 The Inca incorporated their newly won territories in their road network often as much as a symbol of their strength, as well as a means for communication and transportation. While the sites are nowhere as impressive as their counterparts in Peru and Bolivia, I did want to give a quick review to some of the Chilean elements to this complicated site. To revisit the question at the core of Nan’s review (Is it the roads the Incas built to connect all parts of their empire? Or does it refer to the sites the roads connect? ), I feel like within Chile at least, the answer is very much the latter. Chile has inscribed long portions of the road, but very almost no Incan associated sites. The roads themselves are often barely little more smudged trails through the desert, but it's still impressive how much has survived. In some places, local indigenous communities maintain the trail in a good condition. During our Dec 2018 trip, we visited three components - a long stretch that runs for about 25km to the south of San Pedro de Atacama, a small component just north of San Pedro, and another longer stretch running north from the village of Lasana. Of the three, the most ‘impressive’ was the first, with the trail clearly visible through the desert. The setting, with the Andes to one side and Salar de Atacama to the other makes for a quite an experience. It also has the added bonus of being the point where the trail crosses the Tropic of Capricorn. 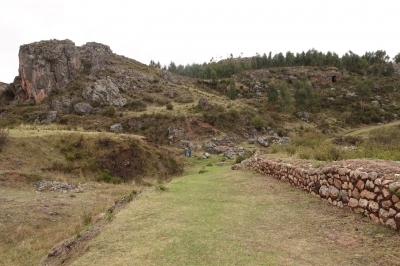 The other sites offered little in and of themselves, though Lasana is home to a rather impressive Pukarả, one of the small local forts of the region that predated the Incans. Either way, they make an interesting diversion if you happen to be in the Atacama area. None of the sites we visited are particularly difficult to visit if you are renting a car. Site visited April 2018. I visited five inscribed sites of the Peruvian section of the Andean road network. This WHS all about roads and archaeological sites associated with them. The Qhapaq Ñan road system is one of the most complex road infrastructures in the world. What makes it unique is its extreme geographical setting. For some reason, this kind of sites are very intriguing for me. Whether it is Silk Roads, Grand Canal, Stećci or Struve, there is something like ’collect all the pieces together’ feeling. At first these inscriptions seem hard to grasp. But when you take a closer look at the single sites there are too many interesting places and you want to include as many sites as possible to your itinerary. But in the end there is time only for very limited amount of sites. Reading the nomination document it takes some time to really understand which sites are actually inscribed and which are not even though they are mentioned in the document. To a non-devoted traveller there are some choices that could seem a bit confusing and inconsistent. For example impressive fortresses in Ollantaytambo are not inscribed even though Ollantaytambo is mentioned as a starting point to one of the road segments. Sacsayhuamán citadel on the outskirts of Cusco is not even mentioned. Llaqtapata archaeological site which is well known among hikers is not inscribed but other site with the same name that is only a minor site. The wall of Portada Rumiqolqa and road that passes through it is inscribed but not the better known archaeological site of Pikillaqta which is just beside it. Plaza Inca Hanan Hauk’aypata was the origin of the four Qhapaq Ñan roads which linked Cusco to all the other parts of Inca empire. Obviously a normal tourist can’t avoid being inside the core zone of this and Cusco WHS. But can you see something authentic resembling ancient roads is a totally different thing. The inscribed area extends about a kilometer to each four directions from Hauk’aypata Square. I walked along all four roads almost from the beginning to the end but it was hard to notice anything but typical Spanish colonial streets. The only remnants from the Inca times was some colonial buildings that have been built on the foundations of old Inca structures. Hauk’aypata Square is maybe the most important single site in this WHS so it is of great symbolic importance even though it is not really a sight in itself. Apart from the Hauk’aypata Square and four stretches of road there is also other archeological site included in the nominated property, Limaqpampa Square, which used to be gathering place for ceremonial purposes. This is a hectic little square with some modern statues and lots of cars. There are archaeological excavations under a glass but I don’t know if it is possible to visit those. Portada Rumiqolqa is considered an ancient entrance door to Cusco from the south. It has been created for road controlling functions. Basically what you see is some 100 metres of thick wall with two openings and a small path that passes through the openings. On top of the wall is an aqueduct that supplied the Pikillaqta citadel with water. The wall itself is a beautiful and imposing work of masonry and it has been nicely restored. But it is hard to spend more than half an hour at the site. 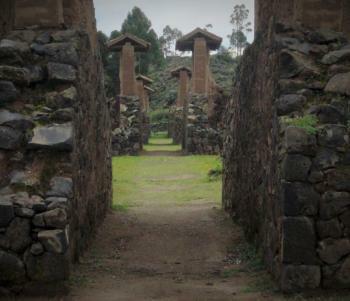 Rumiqolqa along with the archaeological sites of Pikillaqta and Tipón (both not WHS) can be combined to a convenient half day trip from Cusco. Archaeological Sanctuary of Pachacamac: I guess everything worth saying has been said already on the previous reviews (both Qhapaq Ñan and TWHS) so there is no need to repeat those. All I can say is that Pachacamac is a big and sandy archaeological site with a nice museum but after all there is not that much to see. 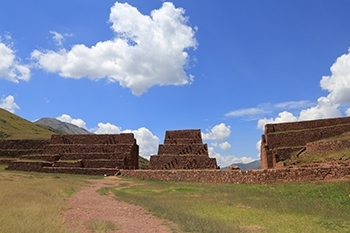 Archaeological Site of Huaycán de Cieneguilla is about a one and half hour’s drive from Pachacamac. The route goes from seaside through Lurín River valley. Half of the route is in a really bad condition so it takes more time than one would imagine looking from a map. Entrance ticket costs four soles. On the site is a small exhibition building. Apparently, it is possible to visit the site only accompanied by a guard. She wanted to get a Spanish-speaking guide for me but I thought it would be useless given my Spanish skills. So she agreed to walk with me around the site. Huaycán de Cieneguilla was an important Inca administrative centre and place of residence of the Inca elite. The site is full of tightly built enclosures, passages and other structures some of which are on quite a good condition. On the structures are also some decorations and trapezoidal-shaped doorways. On the upper slope of the hill is a viewing platform from where it is a nice overall view of the whole site and a surrounding river valley. Archaeological Site of Molle is a small area which is located on the hillside just the opposite side of the river valley, under a kilometre from Huaycán de Cieneguilla. There is not much to see, nor are there any facilities for visitors or even road signs. In the lower part of the hill there are some rectangular enclosures, courtyards and walls. Also some underground structures can be seen. In the middle Qhapaq Ñan passes the area. The upper part is gently sloping dusty hill with just few crumbling structures. Pachacamac, Cieneguilla and Molle can be done as a day trip from Lima. The road from Pachacamac to Cieneguilla and back to Lima via another road forms a loop. Just be careful with huge traffic jams of Lima especially at the ring road near the airport. Well, did I see THE road itself? That is a tricky question. The four congested streets in Cusco were not really what I expected. However, I saw a small path that passes through Portada Rumiqolqa. Qhapaq Ñan passes also through the site of Molle. That is a dusty path that was hardly noticeable. Although this WHS is about roads, my experience is that the associated archaeological sites are the ones that really stand out. Among a large number of nominated sites there are really modest sites, like Molle, and really great sites, like Choquequirao, that could even be WHS on its own. To sum it up, this is very justified inscription but the sites are very varied. The road and the associated archaeological sites are interesting additions to any trip to Andean region. A site like Qhapaq Nan is fairly difficult to grasp. Is it the roads the Inkas built to connect all parts of their empire? Or does it refer to the sites the roads connect? Or a combination of the two? It doesn't really help that the nomination file comes in at 500 MB, the site names are somewhat cryptic IDs and that the GPS coordinates repeatedly do not match the nomination file boundaries. For a detailed discussion using Pachacamac as example, check Solivagants comments in the forum. To tackle the site I visited multiple points along my trip in Peru and Bolivia. You will find comments for each below. Personally, I would prefer the site to be limited to the actual trails instead of serving as a one size fits all nomination for Inka sites. 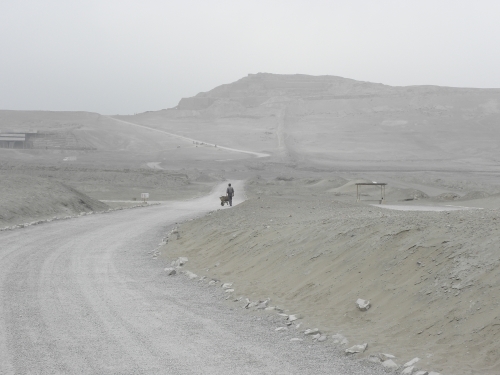 Pachacamac is located South of Lima and a tentative site on it's own. It's here that the Qhapaq Nan reached the coast. Unfortunately, I was not able to find any remnants of the trail and the nomination file and the GPS coordinate took me into some random suburb wihere I was unable to spot any archeological traces. To get there grab a bus on the Panamericana heading South to Lurin. It's in Cusco that I actually found a trail labeled Qhapaq Nan including a sign. It's very well visible (see my picture) and starts near the Templo de la Luna/Chukimarka. The GPS coordinates we show are nearly correct. The trail runs North to Yuncaypata. My recommendation would be to visit Pisac first and on your way back ask the driver to let you get off at Yuncaypata. From the car window I saw the same Qhapaq Nan posting at -13,4883238, -71,9359134, so I would presume that's where the trail starts on the other side. From there it's a downhill hike back to Cusco. The market square in Cusco supposedly was the nexus of the Qhapaq Nan and according to our connection Exact Locations inscribed twice (or more) should count, too. I took a tourist bus from Cusco to Puno with multiple stops in between, one being Raqch'i. The Qhapaq Nan runs right through it. Upon entering the site head straight for the map posted at the entry and you will see it. I would recommend ignoring in the tour guide and focusing your limited time on the Qhapaq Nan remains which are well visible here. The Qhapaq Nan is also marked for Titwanaku. I didn't see any remains, but well. Again a site that counts twice. This is a strange site to visit - how do you determine whether you have 'seen' it, when it's made up of thousands of kilometres of track all across the continent? I consider that I have ticked it off because I walked much of the tracks on my way to Machu Picchu in Peru. But you could so it so many other ways - or even spend years walking different routes and still never technically see it all. I'm glad it has been added to the list, though. It's a really interesting part of national infrastructure and played a huge part in the ability of the Incans to grow their civilisation and conquer so much of South America. I've visited three major elements of the Qhapac Nan WHS in Peru. 1) Pachacamac is a sacred site that was important to the Inca, but long preceded them. The landscape is striking, because the archeological site is within sight of the Pacific ocean, but is very much a desert. Much of the pyramid shaped structure is buried. Pachacamac is truly a monumental site, and must have been stunning even to the Inca. 2) Cuzco is considered the center of Qhapac Nan, indeed the roads all connect to this high-altitude Inca capital. Several streets near the plaza highlight the precision and boldness of Inca architecture. The blocks are enormous, and they look they were set decades ago, not centuries. Behind the cathedral parts of the Inca era palace foundations and walls are visible. 3) Lastly, Raqchi is an important stopping point along Qhapac Nan. The ruined site and surrounding landscape is exquisite. Wetlands surround part of the site, and the various structures highlight varied structures that are somewhat rare. During my visit, Raqchi was merely a stopping point on the road from Cuzco to Puno. I could not have been more pleased, this pit-stop was well worth my time. 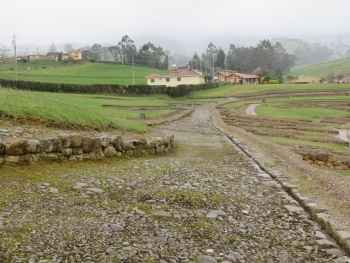 Indeed, a well-preserved portion of the Andean road approaches the ruins. In Argentina this nomination includes multiple locations throughout the Eastern border from Jujuy to Mendosa. I guess it should include the Quebrada de Humahuaca as well. In Salta Province there is a special Inca site atop the Llullaillaco mountain at the height of 6700 meters! Three mummies and an accompanying treasure were unearthed. They are now presented in the Museum of High Mountain Archaeology in Salta (MAAM) where I would recommend a visit. 2.5: Solivagant Alias65 Allan Berry Geert Luiken Peter A. Look where they are, via this Map. Liquid Mercury: The discovery of Mercury at Huancavelica in 1570 allowed the creation of a considerably shortened supply chain for getting that metal to Potosi compared with that from Almaden in Spain! A number of routes were developed. Some contained marine sections (e.g Chincha - Arica) whilst another re-utilised parts of the old Inca Road system via Cuzco and Oruro. "went on to be a part of a larger network which was established between Huancavelica, Cusco and Potosí, along the Mercury route" (Nom File page 926). 131 Community Members have visited.